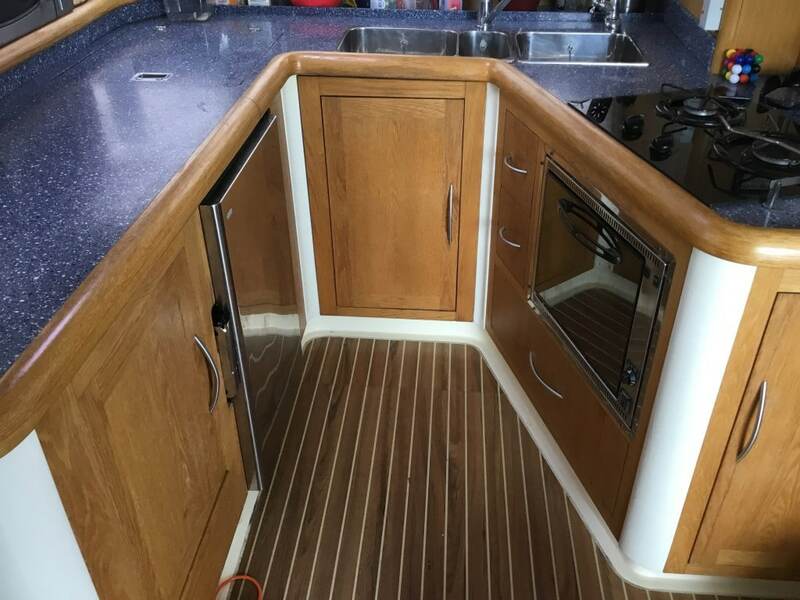 The Broadblue 42 combines a powerful, comfortable and safe blue water cruiser with strikingly beautiful lines, quality craftsmanship and elegant joinery. 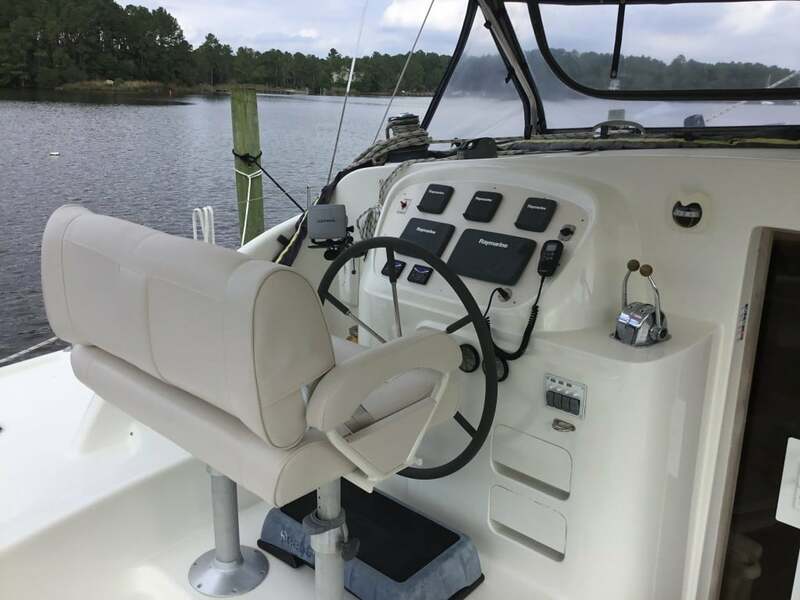 The 42 is designed as a blue water cruiser but its shallow draft attract coastal cruisers who seek comfort and safely during unexpected weather events, short or long distant ocean travels and for its great looks. Hull #6 has the Owner’s interior layout. 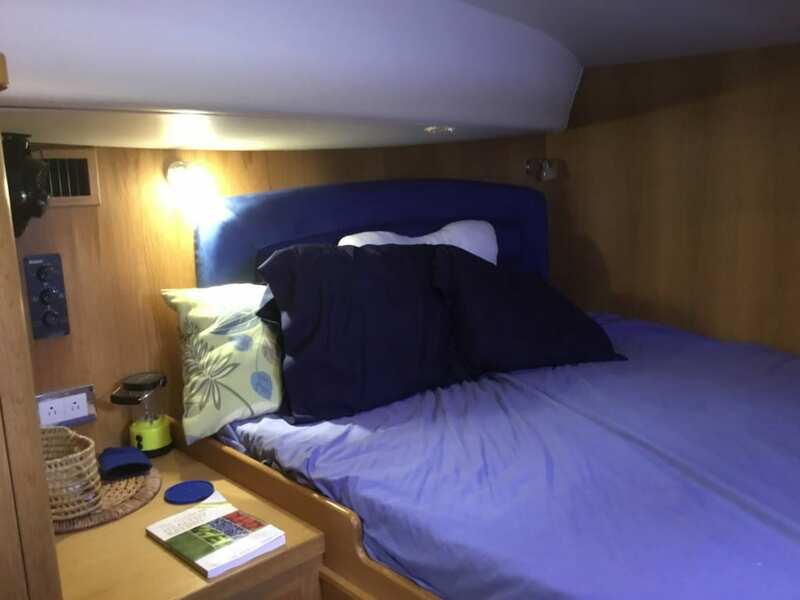 The Owner’s layout is designed for the cruising couple who require comfortable and quality accommodations plus accommodations for guests. 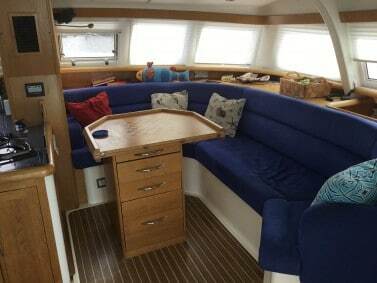 All of the joinery is in American Light Oak with first class quality and attention to detail. All drawers are dove tailed with solid wood and automatic locking mechanisms to minimize opening while underway. 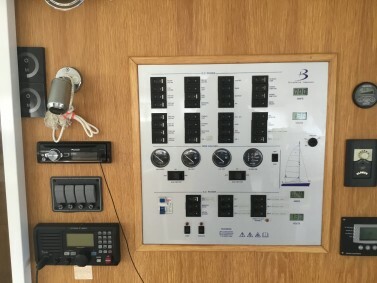 The sail plan has all the halyard and sheets controls positioned for single or short handed sailing. 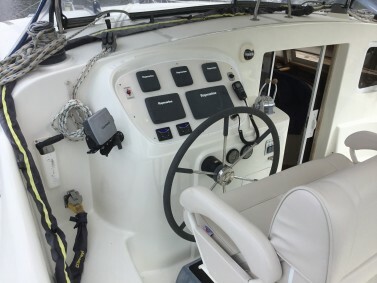 All of the control lines flow back to a single location that includes line clutches and an electric two speed winch. 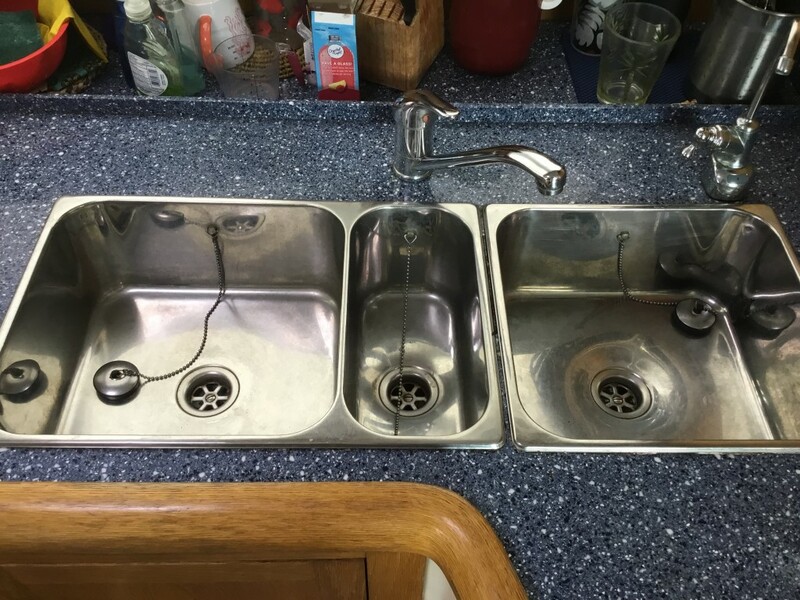 Raising and lowering the main is simple, easy and quick. 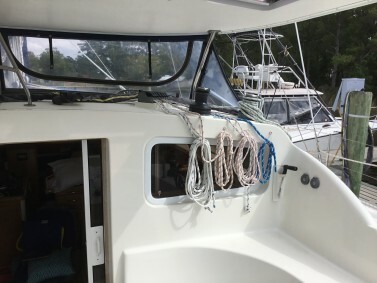 Single line reefing (3 reefing points) can be accomplished in the cockpit using the electric halyard winch. Hull #6 was purchased by owners of Broadblue Catamarans USA and used for their personal use.. 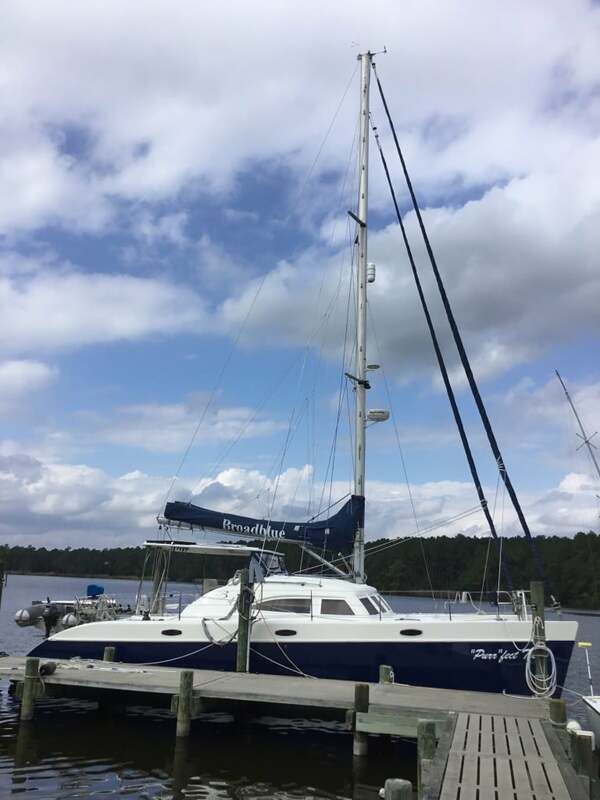 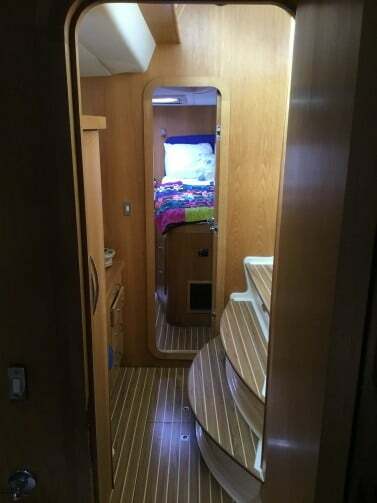 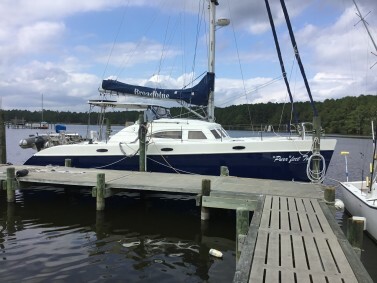 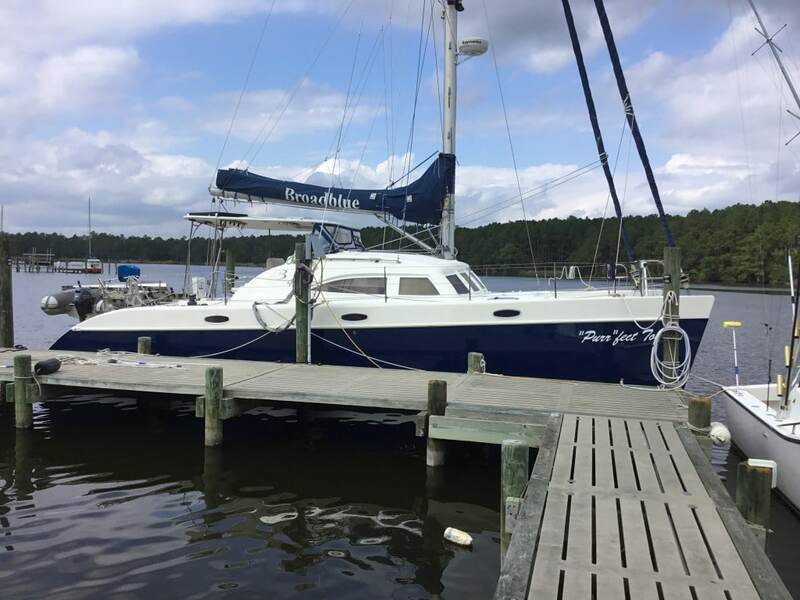 The 42, as you would expect, has been meticulous cared for, cleaned, maintained and outfitted with many additional options and features such as generator, air conditioning, custom blinds, blue hulls, radar, separate chart plotter, electric toilets, stainless steel fridge with separate stainless freezer, and much more. 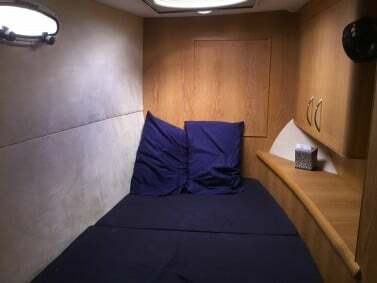 The details are contained in the specifications below. 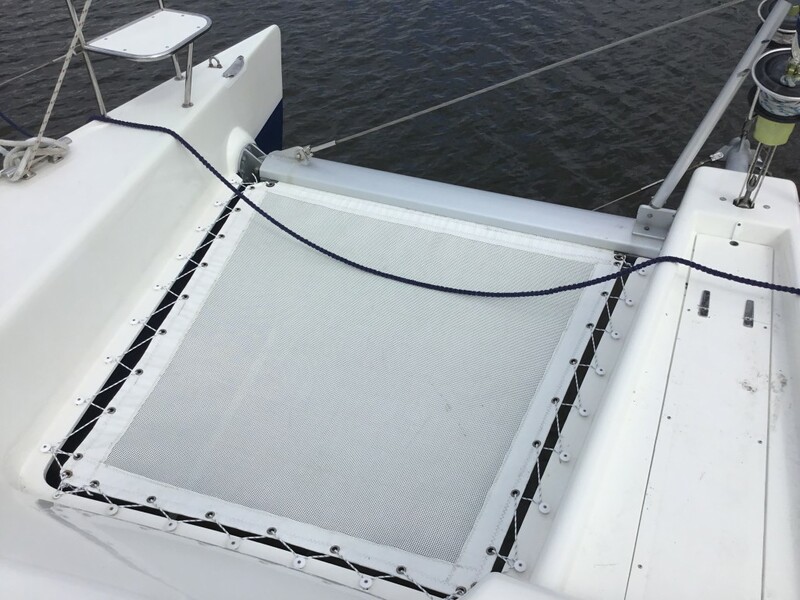 All Broadblue 42’s are constructed to the highest level of the European Recreational Craft Directive, Category A (Ocean) and built using Lloyds approved materials. 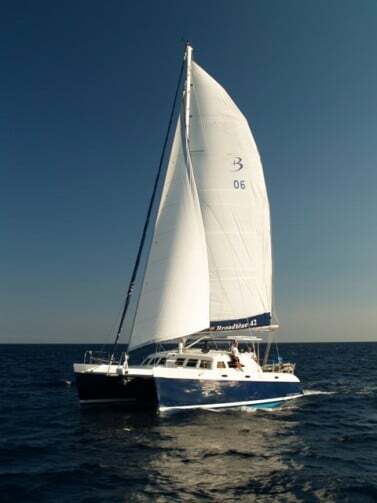 The strikingly tall fine entry hulls, along with the specially designed underside and extra bow buoyancy, are the result of thirty years of design experience. This design allows the boat to sail or flow over waves with less water over the bow, smoother ride and more control in weather seas. 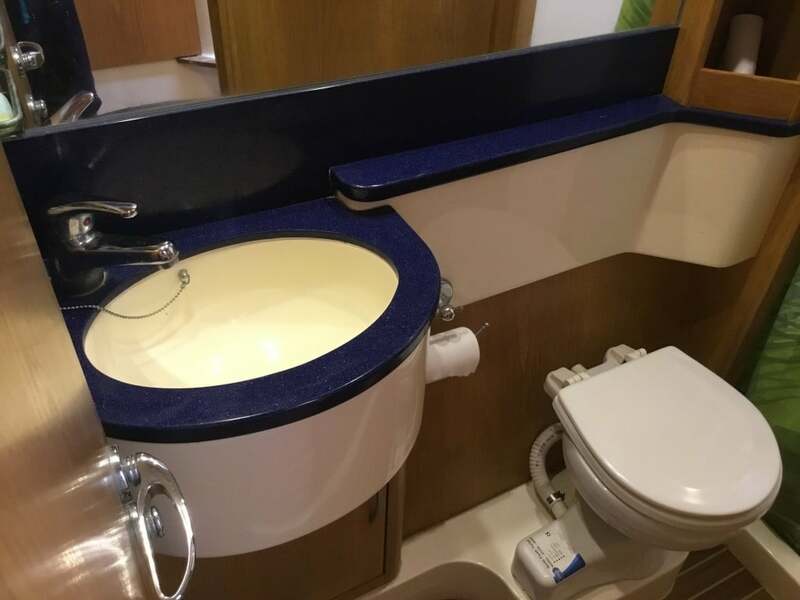 The end result is a beautiful and powerful boat that delivers comfort and safety at sea while operated as a coastal or blue water cruiser. 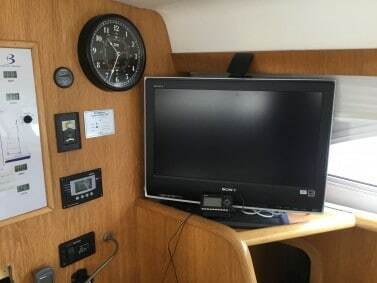 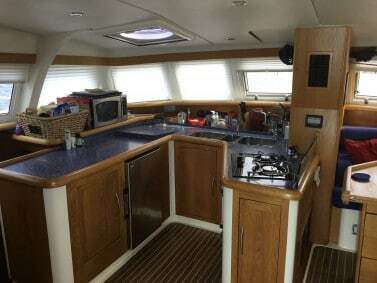 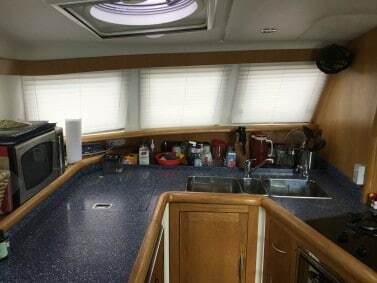 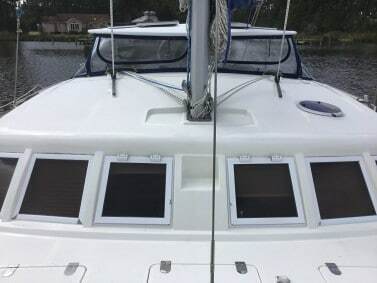 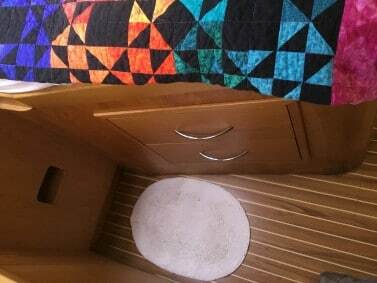 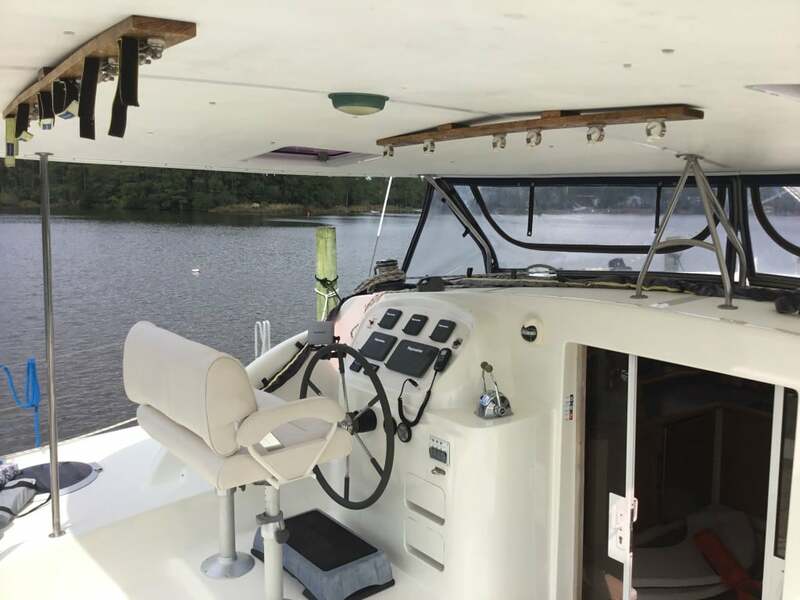 Owner’s Interior Layout: o Owner’s Hull (Starboard): Aft Stateroom with full berth, hatch with blind and screen, port light, overhead lights, hanging locker, drawers and cupboards, 12v fan, air conditioning and electrical outlet. 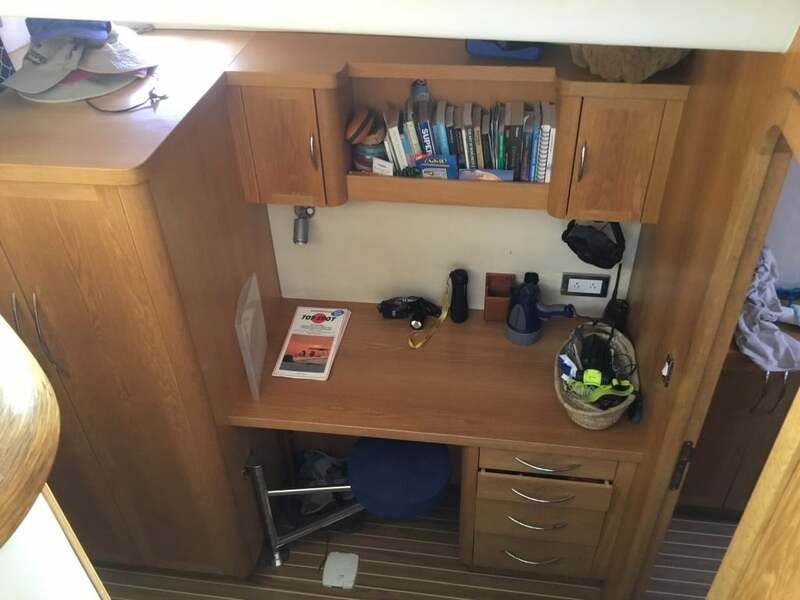 Functional desk with swing out seat, 12v and 110v outlets, port light and large storage locker are located midships. 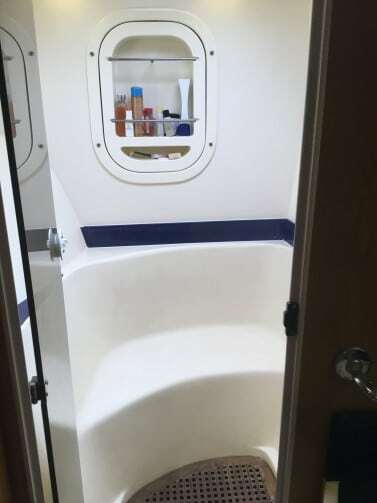 A large bathroom forward with blue Corian top, mirror, towel rack, port light, lighting, electric PAR toilet with a 21 gallon holding tank, 12v fan and hot/cold water fixtures. 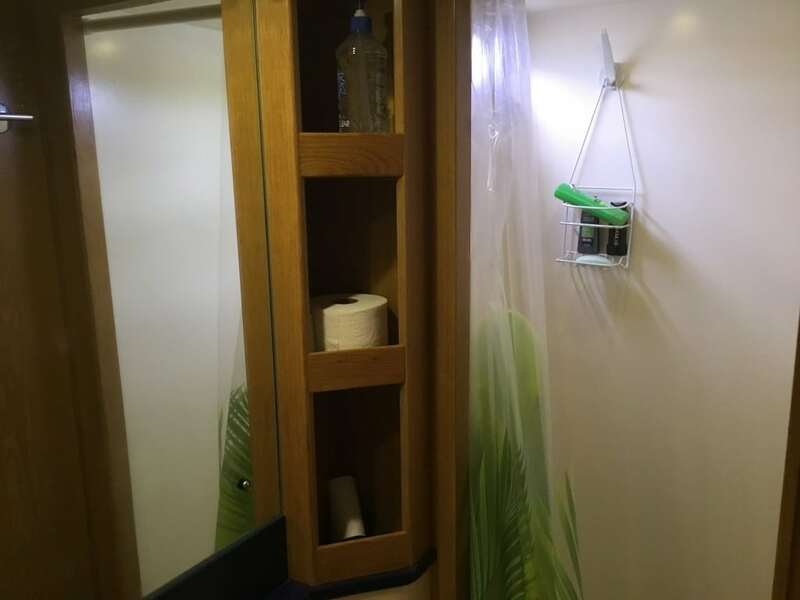 A separate large shower is forward the bathroom with door, seat, electric shower pump, hatch with blind & screen and hot/cold water fixtures. Very nice. 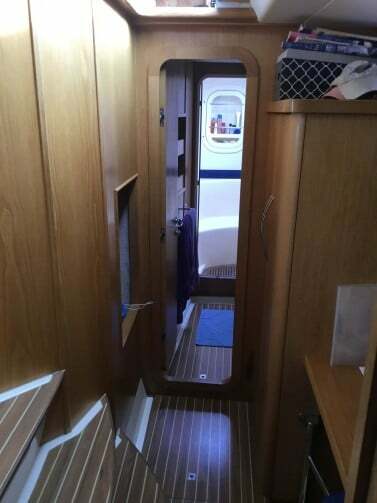 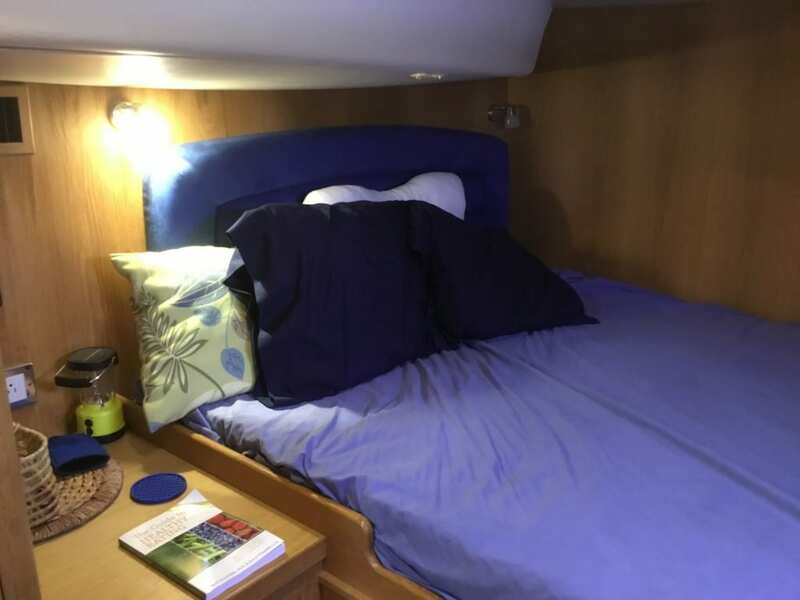 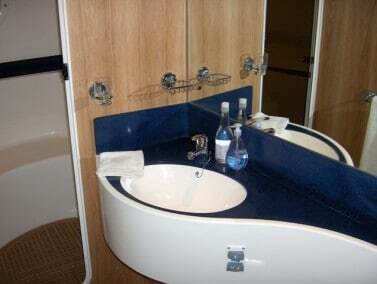 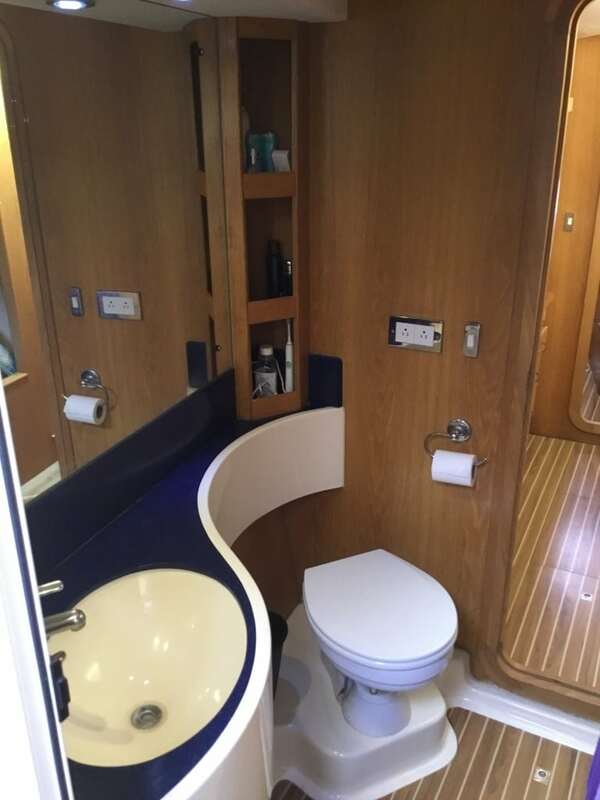 Guest Hull (Port): Aft Stateroom with a queen berth, hatch with blind & screen, port light, overhead lights, hanging locker and cupboards, 12v fan, electrical outlet and air conditioning. A shared bathroom and separate shower are located midships. The bathroom is smaller than the owner’s bathroom but has all the same features including the electric toilet, 21 gallon holding tank and Corian surface. 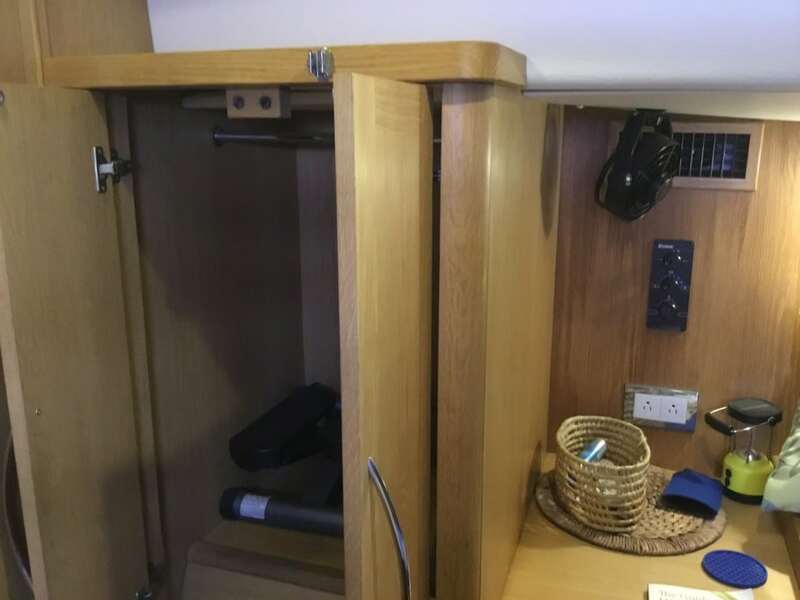 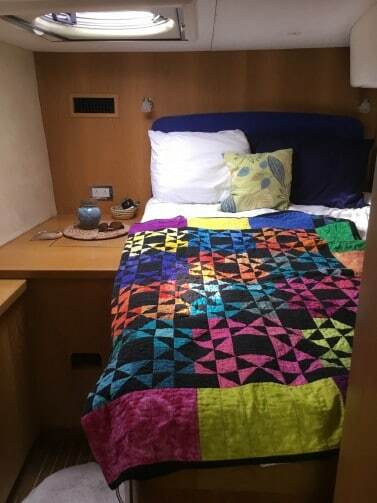 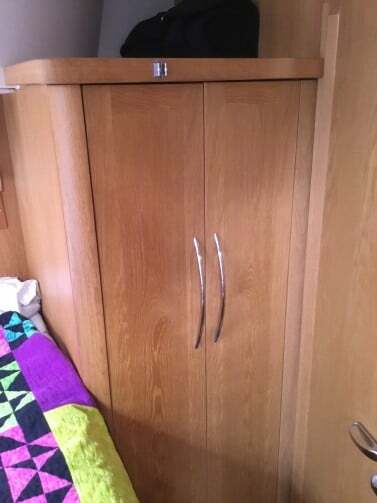 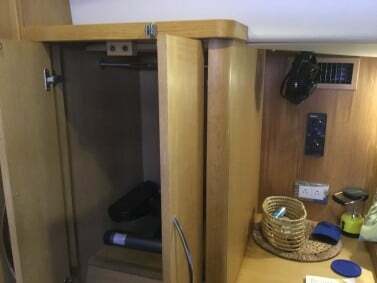 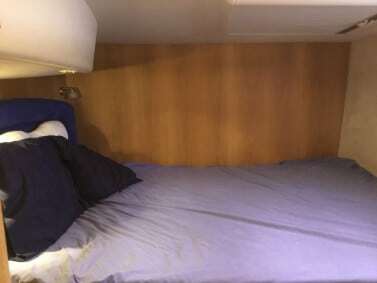 A guest stateroom is forward with a full berth, storage underneath, hanging locker and cupboards, overhead lighting, 12v fan, electrical outlet, hatch with blind & screen, port light and air conditioning vent. 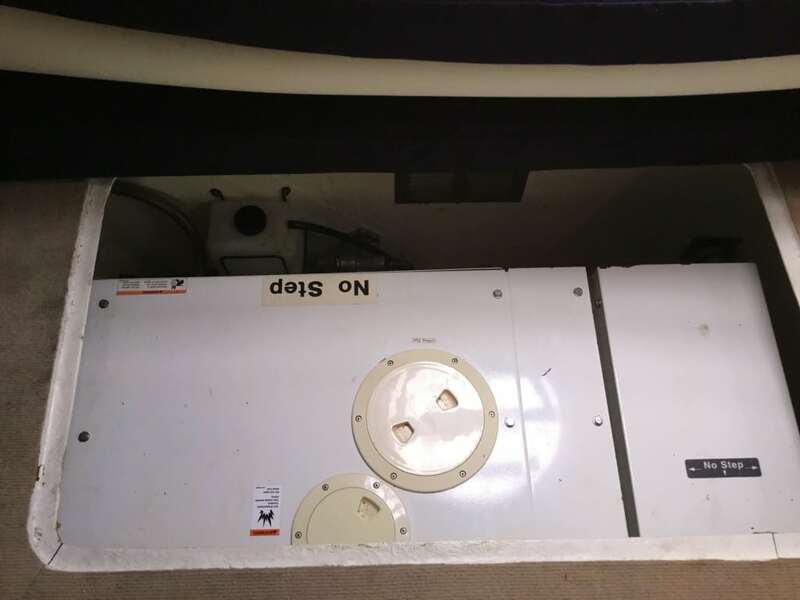 Services:  Water tank holds 125 US gallons and comes with an inspection hatch, filler and vent. 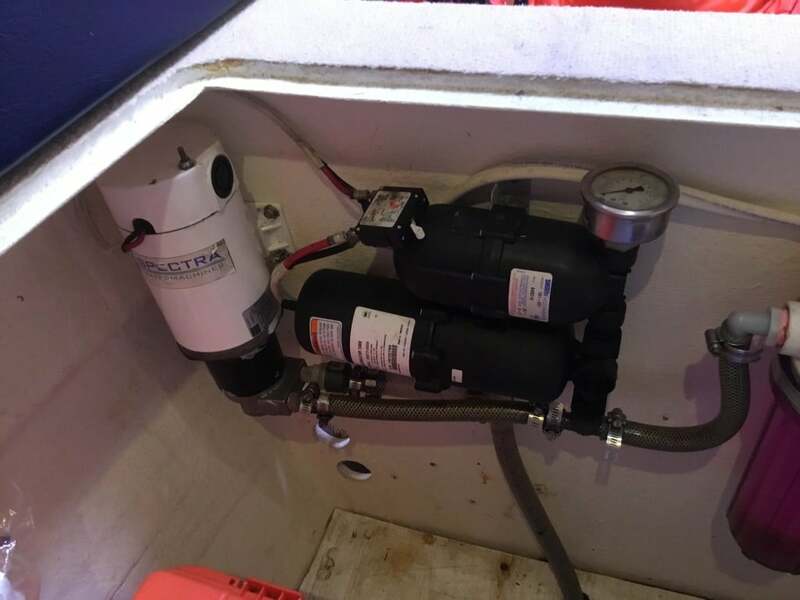  Pressure water pump to feed the galley and both bathrooms/showers. 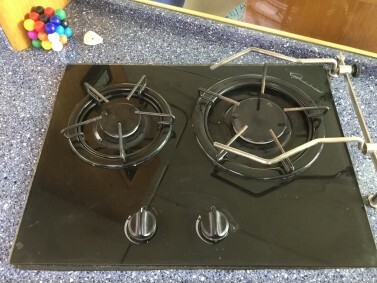 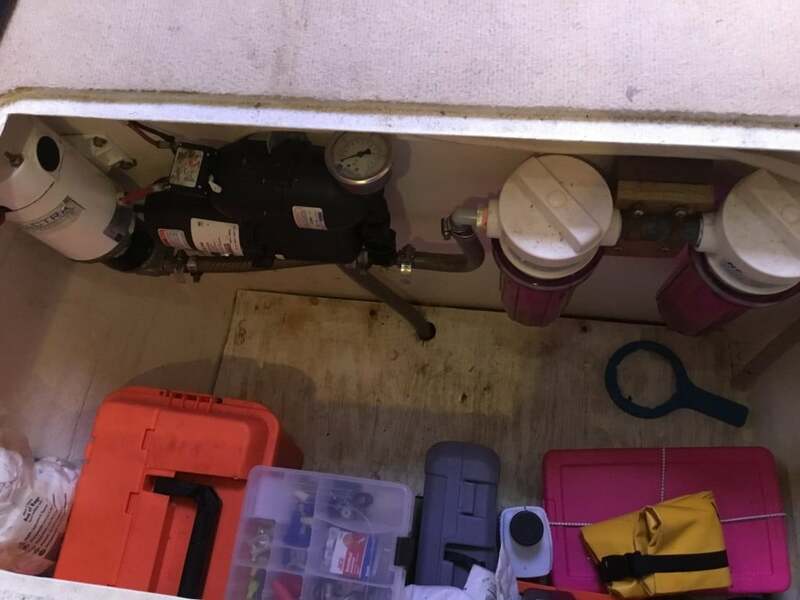  12 gph Water Maker, Spectra, 12v, manual with some automatic functions  Propane gas bottles located in forward deck locker that feed stove and oven.  Manual Bilge Pump (2 of) located in cockpit to drain both hull sumps  Automatic Bilge Pump (2) in each engine room  Fuel tank holds 117 US gallons and comes with fuel shut off vales, filters, and filler fitting. 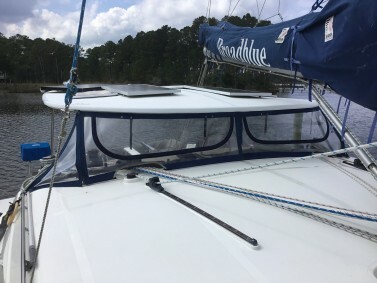 Hulls: The BB42 has the optional Blue Hulls, awesome. 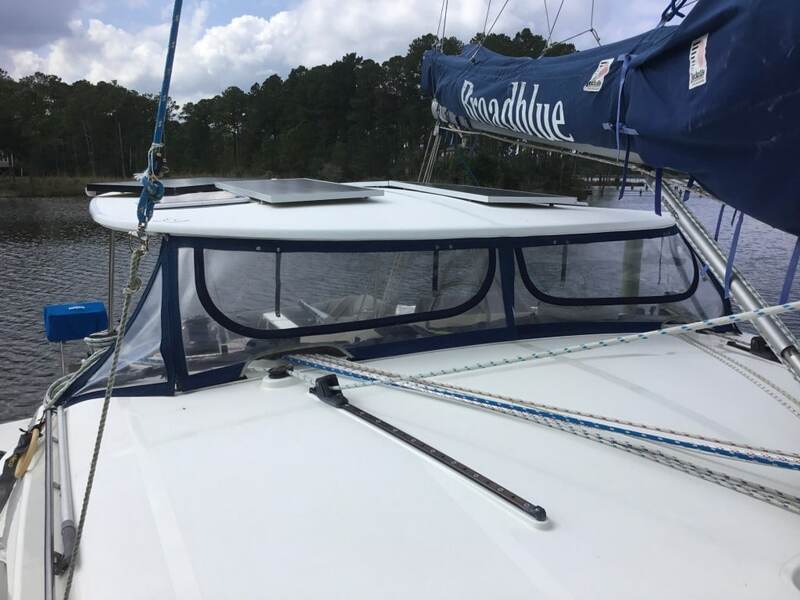 All Broadblue boats have solid fiberglass hulls below the water line that are hand laid using powder bound mat, biaxial woven rovings, and isopthalic resin. The solid laminate hulls can range between ½ thick near the water line to over 1 inch thick in areas of higher loading such as the keels and engine room. 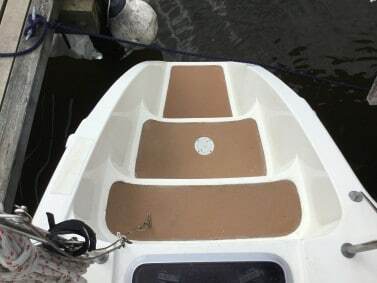 The same materials are used above the water line and a balsa core is incorporated in the topsides and deck. The hull and deck joint is fully bonded using fiberglass (no mechanical bonding here and the fiberglass eliminates leaking) and is protected with a rub rail. 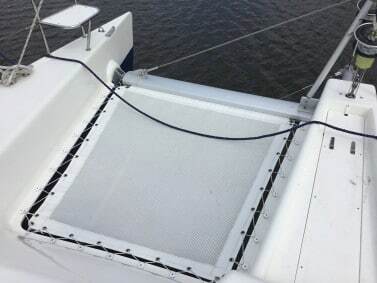 Kevlar is added in high stress areas such as around the chain plates. 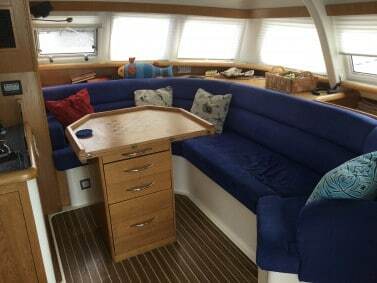 The structural bulkheads are of vacuum bagged foam core, and when the interior furniture is fully bonded, a light and stiff ‘honeycomb’ structure is created. The 42 has watertight bulkheads and buoyancy compartments fore and aft (4 of). 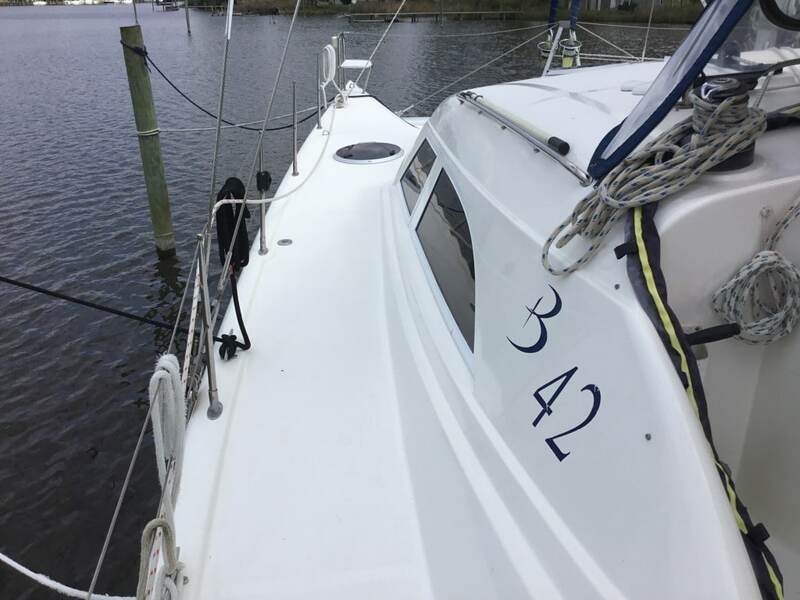 The keels are integrally molded and sealed off from the hulls forming a double bottom. Skegged rudders are hydraulically controlled. 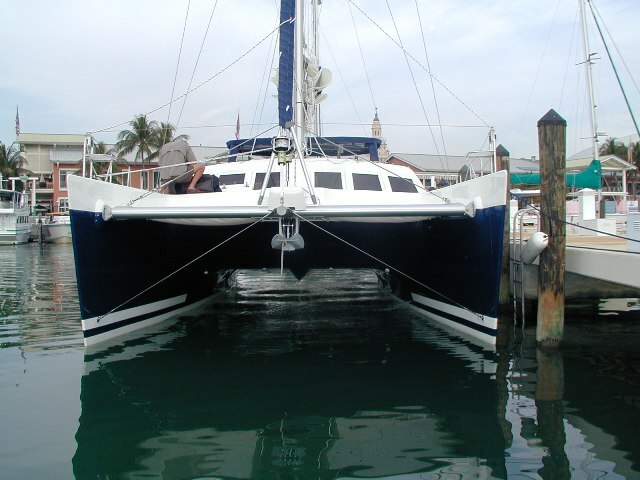 The 42 has strikingly tall fine entry hulls that make for a more comfortable and safer ride in seas. The tall hulls along with the unique underside allow the boat to flow over waves rather pounding through them. 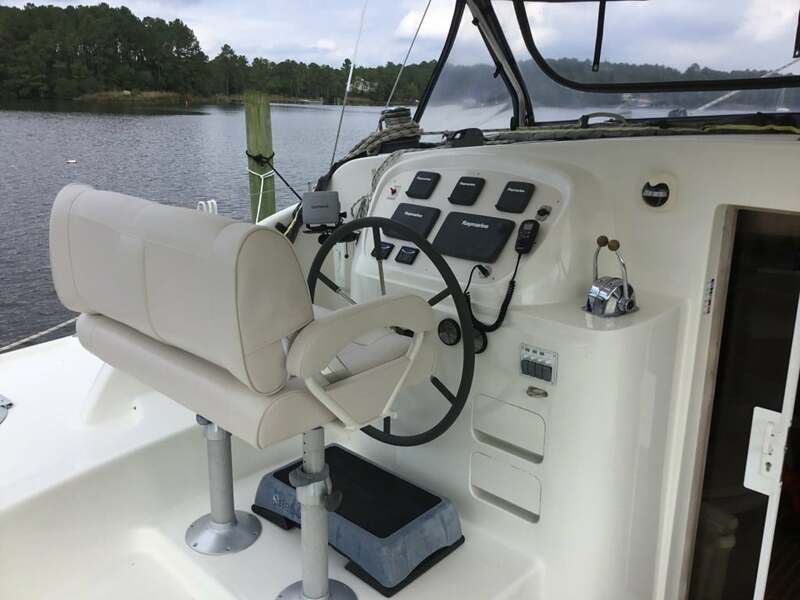 The end result is obvious, a powerful and beautiful boat that delivers comfort and safety at sea while operated as a blue water or coastal cruiser. 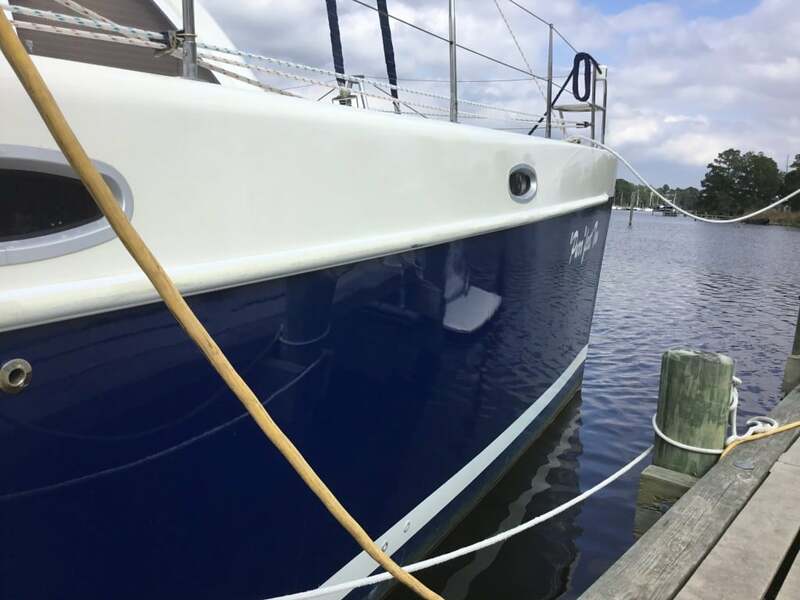 The Blue Hulls were recently repainted along with 2 coats of clear on the entire hull, bow and transom. Nice and shiny. After splashing in the salt water, just rinse with fresh water and soft brush to bring back the wet looking shiny hull.